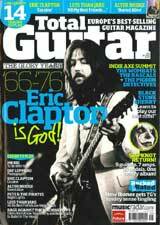 Total Guitar September 2008 PDF download. Complete issue, cover to cover. Total Guitar is an interactive guitar magazine. Every issue brings songs to learn, with CD audio to help you play along, reviews of all the latest guitar equipment, and interviews with all the biggest names in the guitar world! Total Guitar regularly contains tablature for Rock, Acoustic, Punk, Blues, Classic Rock and Metal, as well as detailed profiles of guitarists and their specific techniques and playing styles. Total Guitar is aimed at players who would like to learn how to play guitar, with dedicated beginner tutorials in acoustic and electric guitar, as well as helping those who can already play guitar to develop their playing style and learn new techniques and songs. Less than Jake – Back, loud and proud, with a record hotter than the Florida sun! Slipknot – Could comeback record All Hope Is Gone be the last for the 18-legged beast? Learn to play sizz new Black Stone Cherry tracks on your TG CD! Video lesson: Newton Faulkner – Play bass, melody and percussion, and re-tune on the fly! Video lesson: Alex Skolnick – Hunting for hot new licks? Look to the brass players!